I think this might be the first sonnet that’s come up in this editing project, but I can promise you it won’t be the last. Sonnets are a my love hate poetic form. Where often I find my poems are about 14 lines anyway, the idea of making a sonnet from scratch with the correct rules is miserable. I will remind you again and again that having a form is a crutch, and missing a form is an excuse. 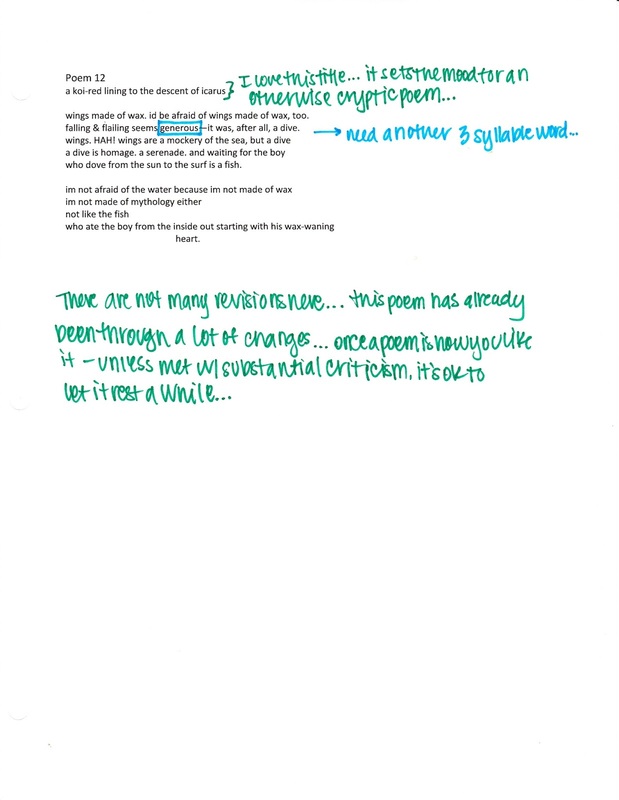 When looking at how to edit a poem successfully, keep in mind that molding the shape to fit or transcend a set guideline will allow you to better the piece (even if it just reaffirms that the origional is the best format). This sonnet was from a sonnet assignment. 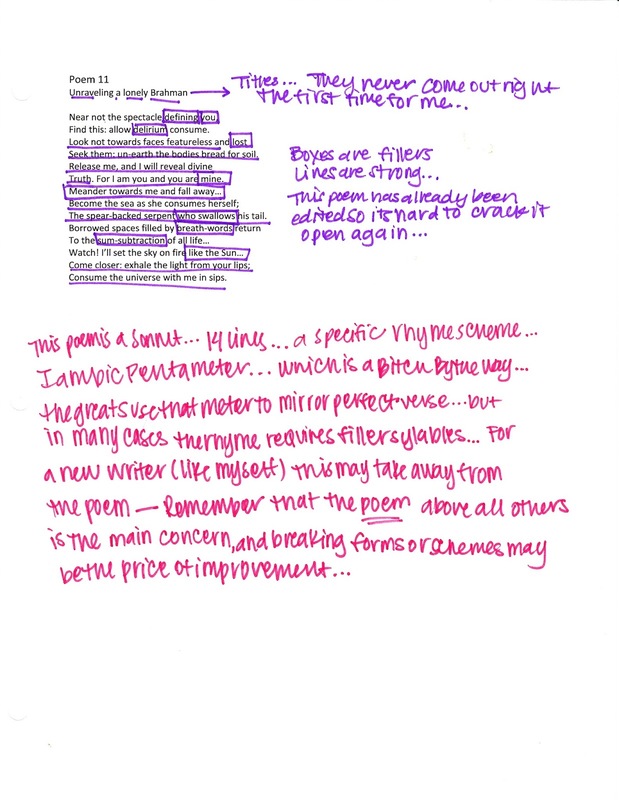 I might not have tried to tackle a true sonnet had I not been threatened with a grade. The idea of Iambic Pentameter, which makes my skin prickle, and a faint but steady constant rhyme, also on my list of no-thank-you’s, make the Shakespearian Sonnet a nightmare. My version is often a loose but reverent version of the form, without limiting myself too much with the mechanics. Still, the sonnet has a feeling unlike other poems. Fourteen lines is often the perfect amount to express and idea without being too heavy handed, and the overall effect of a short tight poem is visually pleasant as well as universally approachable. And often, despite my prior hang-ups about the rules, I find myself editing into loose sonnets to make the piece feel more polished. For this version–which has been edited before for classwork and my thesis–it’s easy to see the errors, but not so simple to revise them. I advise you to read the poem carefully several times before going in and tweaking little things. Getting wrapped up in word after word will leave you unclear about the final message. If sonnets are anything, they are well balanced. After deciding that the point of the poem (that heroic couplet at the end) is what I want, I can go back and mark (in squares) the sections that I would like to revisit. Often this will take a while, some days you will want to edit something out, others will make perfect sense. Remember that editing is a process and not a product. 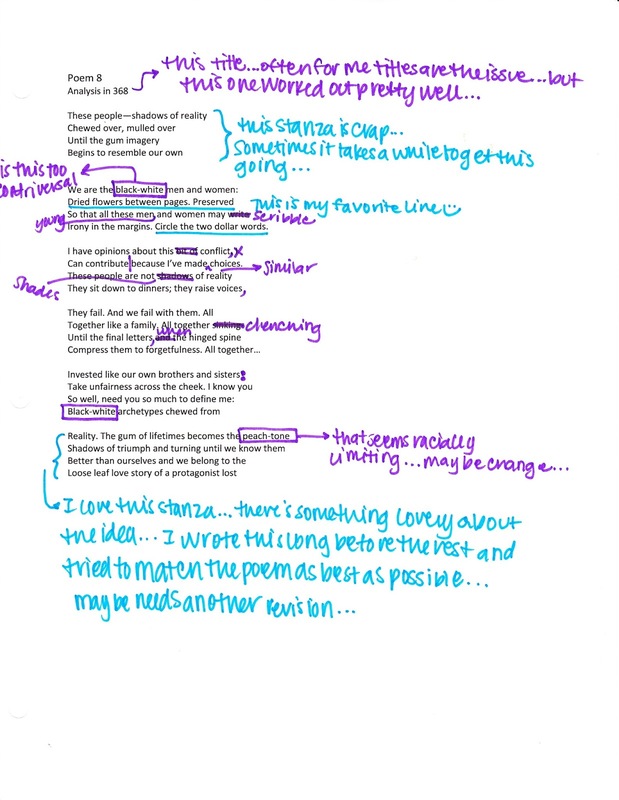 Sonnets are a tricky form that can be a good tool for the editing process. Take a poem that isn’t a sonnet and make it fit; take a sonnet and break it away from the form itself. 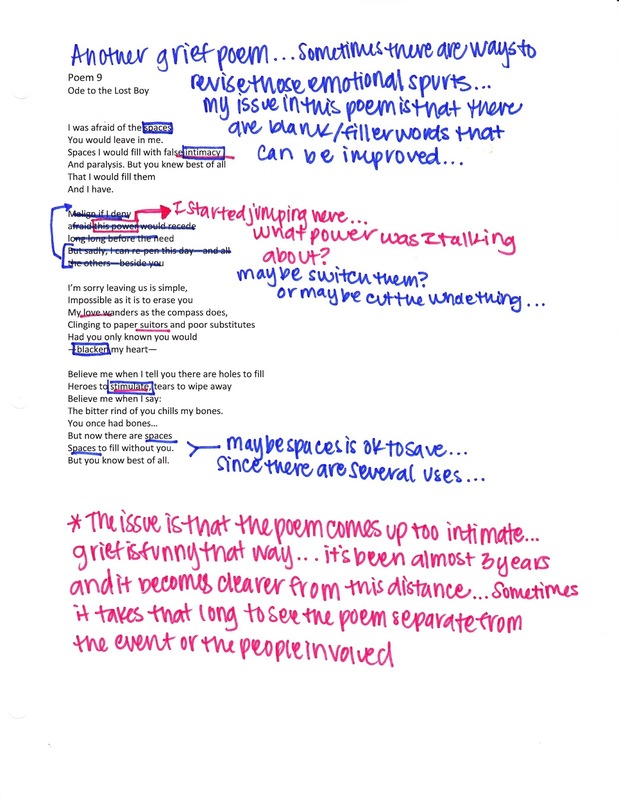 Make the form work for the poem rather than the poem work within the confines of a poem. If you like the idea of a form but are a little unsure about the rules, remember that there are no rules that say you have to take the poem for exactly as the form describes. Be reckless. Be riveting. Just commit to a few of the mainstays of that form and call it a day. A poem is only as good as its high points, and a bad sonnet will only be remembered for is inability to master form.